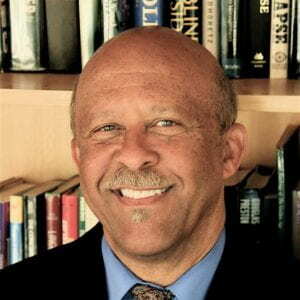 Ernest J. Wilson III, Ph.D., professor of communication and political science, is founder and director of the USC Center for Third Space Thinking. He is also a faculty fellow at USC Annenberg’s Center on Public Diplomacy, a member of the board of the Pacific Council on International Policy and the National Academies’ Computer Science and Telecommunications Board, and a member of the American Academy of Arts and Sciences. He served as dean of the USC Annenberg School for Communication and Journalism from 2007 to 2017. Lastly, he was on the board of the Corporation for Public Broadcasting from 2010, the last year as chairman. Dean Wilson’s experience at the intersection of communication and public policy spans the private and public sectors. He has served as a consultant to international agencies such as the World Bank and the United Nations, worked in government at the White House National Security Council and the Corporation for Public Broadcasting, and led research centers and academic departments at premier institutions of higher education. With an academic focus on the convergence of communication and information technology, public policy, and the public interest, Dean Wilson is a student of the “information champions,” the leaders of the information revolution around the world. His current work concentrates on China-Africa relations, global sustainable innovation in high-technology industries, and the role of politics in the diffusion of information and communication technologies. In addition to his most recent books – Governing Global Electronic Networks and Negotiating the Net: The Politics of Internet Diffusion in Africa – Dr. Wilson co-founded and co-edited the MIT Press series The Information Revolution and Global Politics and the journal Information Technologies and International Development. Nominated by President Clinton in 2000, Dean Wilson served on the board of the Corporation for Public Broadcasting until November 2010. He founded the board’s New Digital Media Committee and Public Awareness Initiative Committee. He is a member of the Carnegie-Knight Commission on the Future of Journalism Education and The National Academies Board on Research Data and Information. He was deputy director of the Global Information Infrastructure Commission from 1994 to 1995. Dean Wilson’s other government experience includes service as director of International Programs and Resources on the National Security Council at the White House (1993–94) and director of the Policy and Planning Unit, Office of the Director, U.S. Information Agency (1994). He advised President Obama’s transition team on matters of communication technology and public diplomacy. Formerly a professor and senior research scholar at the University of Maryland, College Park, Dean Wilson was director of that university’s Center for International Development and Conflict Management from 1995 to 2002. He previously served on the faculties of the University of Michigan and the University of Pennsylvania. Dean Wilson is the recipient of numerous research fellowships and awards, including the Distinguished Scholar Award from the International Communication section of the ISA, an International Affairs Fellowship from the Council on Foreign Relations and a postdoctoral fellowship at the Kennedy School of Government at Harvard University. He serves on the editorial advisory board for Demand Media, a leader in online content creation and social media. Originally from Washington, D.C., Dean Wilson earned a Ph.D. and M.A. in political science from the University of California, Berkeley, and a B.A. from Harvard College. He is married to Francille Rusan Wilson, Ph.D., a labor and intellectual historian. They have two sons.